Carl Ripoli’s “philosophy of rational freedom,” as he termed it, is based entirely on a new perception of reality that in many ways revived and re-articulated in modern vernacular the philosophical premises of the ancient Greeks, Henry David Thoreau, Walt Whitman and the multifarious philosophies that sparked many experimental communal settlements of 18th century America urging a return to nature in order to re-find the authentic life. On the surface, his ideas are not new, but the radical element beneath Ripoli’s assertion was that without total freedom, no system—whether man-made or natural—could achieve perpetual harmony and balance; that without total freedom, no natural biologic or man-made system could affect a natural rebalancing of all their respective elements; that although there is no moral conscience in nature, there is a natural form of justice that equates with nature’s perpetual movement back toward harmony and balance in response to any form of imbalance. Creation is a composite of one dialogue edited from transcriptions of taped conversations with Ripoli stretching over 12 years. In its own way, Creation miraculously captures the very essence of Ripoli’s ideas in the vernacular of his true voice. His language is more dynamic and faithful to the spirit of his thinking and the radical ideas he proposed with more accuracy than the incomplete manuscript of Utopia he was never able to complete. 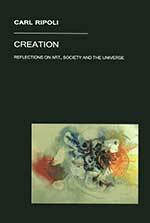 Secondly, since this book does not presume to duplicate to the letter Ripoli’s book Utopia, it was decided to give it the title he planned to give his last book, Creation. In many ways, the title encapsulates the same ideas expressed in Utopia, but goes a step further intellectually as reflected in the nature of his evolving thoughts and ideas, revisions and speculations expressed over the twelve years engaged in intellectual conversation and which this book represents. As such, it is a distinct volume to itself, perhaps a more inclusive coda for all he wanted to re-articulate in a different guise, but never lived long enough to realize.